What is the reason to have a Mac Pro system? Some people may point to the performance, and while others will point to the appearance. No matter the reason, you tend to discover regardless that Apple has put an extraordinary amount of effort of the Mac Pro line in both its performance and appearance. Using a system like the Mac Pro, maintaining top notch performance is vital. However, using mechanical hard drive creates a massive bottleneck in any system. Therefore, SSD (Solid State Drive) is undoubtedly the most important component to upgrade with your Mac Pro. However, the Mac Pro Sled is only designed to fit 3.5" hard drives making it naturally incompatible with SSD, which use a 2.5" format. With that said, a converter kit is required to upgrade an SSD on your Mac Pro system. Using the same thorough approach as Apple has, we designed the MB982SP-1S 2.5" to 3.5" SATA SSD converter for Mac Pro users. The design of the MB982SP-1S is specifically styled to match the Mac Pro monochrome coloring, giving an excellent finished look overall. Keeping the same styling all across the board keeps everything neat and professional. The crucial part however, is how the MB982SP-1S will work in the Mac Pro. The functionality to be able to fit perfectly into your Mac Pro is a must, and using carefully designed mounting holes to match exactly with a normal 3.5" hard drive, the MB982SP-1S will mount correctly with any Mac Pro version to date. 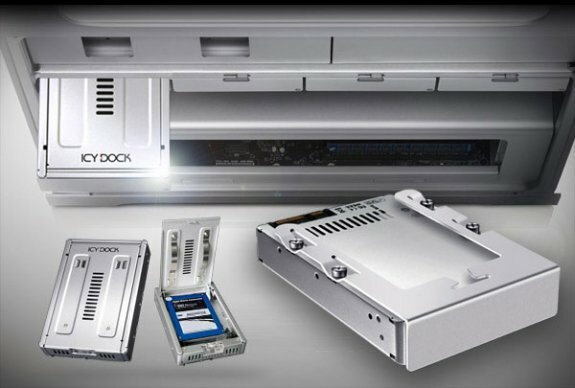 What areas would SSD's increase the performance of your system? Silveradosys.blogspot.com has done several real world tests on performance using iCal, Numbers, Pages, iPhoto, Adobe Photoshop, iTunes, Final Cut, Illustrator, MS Word, Safari, Mail and Startup. Using an HDD versus Intel X25-M SSD there is hardly a comparison between the two in the results. Also, the experiment was conducted in early 2009, and so using some of today's top of the line SSD's will yield greater results than what has already been demonstrated. For any media professionals who want to keep their productivity at its peak, using an SSD will help achieve that goal. The MB982SP-1S is a full metal heavy duty 2.5" converter that will protect your SSD against a direct hit to the drive, provides better heat dissipation to the SSD (Yes, SSD does produce heats). Our patented "tool-less" design allow users to quickly install or remove SSDs with no tools required. This is perfect for media professionals when transporting your SSD from one location to the other, with or without MB982SP-1S. Don't compromise yourself by using slow 3.5" hard disk; don't compromise yourself by using the average SSD converter. You are a professional user with a high-end, world's fastest computer system and you deserve a fast SSD with the best quality SSD converter. Oh, there is one more thing; the MB982SP-1S supports SATA 6Gbps speed with no performance loss when using with any SSDs.